Awesome treasures include keys, chests, potions, upgraded armor, and more! Game design and all character art created by 8-year old Benjamin Howard! Free Version Available On Amazon App Store! Sir Hoppity: Challenge of the Dragon has arrived in free trial version form! Amazon.com Try out this free version with an in-game upgrade option only on Amazon App Store. Become Sir Hoppity and battle away with your magic carrot sword. Go, brave bunny knight, go! 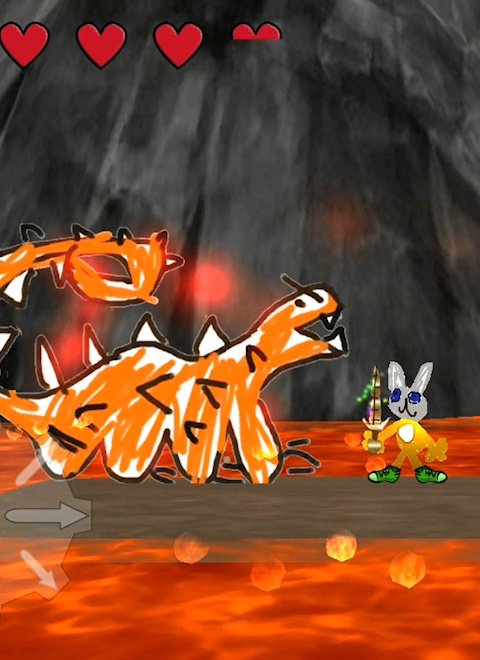 Sir Hoppity: Challenge of the Dragon RELEASED! Sir Hoppity is now available for Android devices! We couldn't be more excited about our first release and we hope you'll try it out today! The Amazon App Store review process is finished, and we are set for January 1st release! Open Beta - Playtesters wanted! Our 7-day open Beta kicks off NOW for Sir Hoppity: Challenge of the Dragon, our fun comic adventure platformer! What a cool idea! I love the original concept. Thank you for the kind comment and support! We are very excited for our first title! Thank you for visiting our new IndieDB page! If you like the concept or have ideas, let us know in the comments section here!